Roissybus shuttles link Paris-Opera and CDG, Le Bus Direct coaches go to Etoile, Eiffel Tower, Montparnasse, and Orly, and Noctielien night buses to Gare du Nord & De l’Est. Getting to Charles de Gaulle Airport (CDG) from downtown Paris is easy by bus or rail. RER train line B is generally the fastest public transportation to Charles de Gaulle but many travelers prefer the convenience of bus services. The cheap Roissybus links the airport with Paris Opéra Garnier, the Le Bus Direct (previously Les Cars Air France) luxury limousine coaches go to Etoile, Eiffel Tower, Port Maillot, Gare de Montparnasse, Gare de Lyon, and Orly Airport (ORY). Late at night and early morning, Noctilien buses provide a useful service to many parts of Paris. Small groups may find airport shuttles worth the splurge especially if hotels are not located close to the final stops of buses – prices vary widely so do compare before booking. Taxi2Airport and Suntransfers give online quotations for private airport transfers without first requiring personal details or flight numbers. 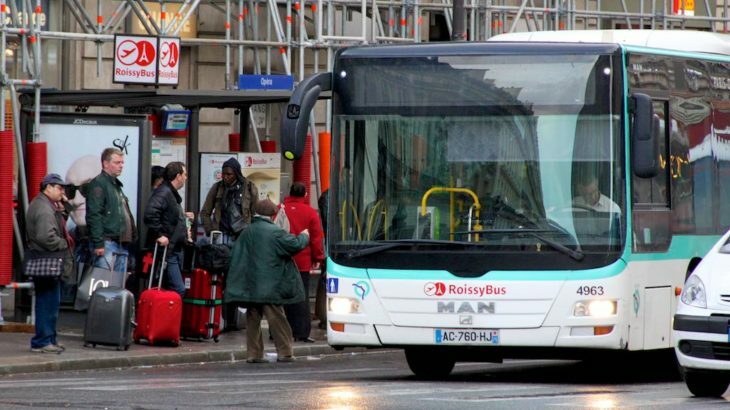 The Roissybus is probably the easiest and one of the cheapest ways to travel between downtown Paris and Paris-Charles de Gaulle Airport. The Roissybus links Opéra Garnier and Aéroport Paris-Charles de Gaulle three to four times per hour from around 6 am to shortly after midnight. The journey takes 45 minutes to an hour but can be longer if traffic is very heavy. In downtown Paris, the Roissybus stops at the opera house at the intersection of Rue Scribe and Rue Auber. At Paris-Charles de Gaulle Airport the Roissybus stop at Terminal 1, several times at Terminal 2, and at Terminal 3. As the Roissybus is run by Paris public transportation (RATP), most transportation passes are valid (zone 1-5 required). The one-way fare is currently €12.50, which is slightly more expensive than the RER ligne B suburban train but cheaper than the more comfortable Le Bus Direct. Buy tickets at RER and Metro station vending machines or directly from the driver. An alternative public bus that may be of use of some travelers is bus 350. It connects Charles de Gaulle Airport and Gare du Nord and Gare de l’Est train stations. It is a regular bus that stops many times en route. Traveling time is around 80 minutes but a ticket is only €6. Le Bus Direct (previously called Les Cars Air France) limousine buses are a very popular way to travel from Parisian airports to downtown Paris. The buses are comfortable, air conditioned, and offer space for luggage. Seats have UBS charge ports and free wifi is offered. Le Bus Direct operate on the three routes generally two to three times per hour from around 6 am to 11 pm with traveling time around an hour. Les Cars Air France Line 2 links the Eiffel Tower via Place de l’Etoile (Arc de Triomphe) and Porte Maillot with Charles de Gaulle Airport. The one-way fare is €17. Les Cars Air France Line 3 is a transit bus between Orly Airport (ORY) and Charles de Gaulle Airport (CDG). The one-way fare is €21. Les Cars Air France Line 4 runs from Gare Montparnasse via Gare de Lyon to Charles de Gaulle Airport. The one-way fares are €17. Return trips are slightly cheaper than one-way tickets and children 4 to 11 received discounts. Groups of four or more receive discounts if booking online. Tickets are not limited (or guarantee a seat) to a specific departure. Between shortly after midnight and around 5 am, Noctilien night buses are the best public transportation option for travelers from downtown Paris to Charles de Gaulle Airport. Two Noctilien night bus lines connect Paris-Gare de l’Est (via Gare du Nord) with Paris-Charles de Gaulle Airport (CDG). Bus N143 makes the journey around twice per hour in 45 minutes to an hour. Bus 140 is less frequent and follows a different route to the airport that takes well over an hour from Gare de l’Est. Both bus N140 and bus N143 stop at all three airport terminals (at Terminal 2 only at the Gare TGV and not at various gates as with many other buses). Night buses require special tickets but many transportation passes are valid. Tickets bought on the bus (€8) are slightly more expensive than those bought in advance from vending machines or ticket windows. Transfer tickets are not available – each bus change requires a new ticket. A large number of service providers offer private airport shuttle minibuses and vans from Paris-Charles de Gaulle Airport (CDG) to any destination including Euro Disney / Disneyland Paris. These shuttles can be good value for money for small groups and are also worth considering when traveling with luggage, small children, or to destinations not close to the terminals of other forms of public transportation. The prices of airport shuttle services to Paris-Charles de Gaulle vary widely. It is worth getting quotes from several companies and compare before making reservations. Taxi2Airport gives online quotations for private airport transfers without first requiring personal details or flight numbers. Taxis from Paris to Charles de Gaulle Airport is by the meter but expect to pay at least €50-€70. Surcharges are added for night-time travel (5 pm to 10 (!) am), Sundays, national holidays, luggage, and more than three persons per car. Suburban train line RER B is the best alternative to buses when using public transportation to Paris-Charles de Gaulle Airport. The train is an especially good choice when traveling without luggage or to avoid getting stuck in traffic during peak hours (although the train does get very crowded).